The goal of a golf swing is to strike the ball achieving maximum distance with a high level of accuracy.All great ball strikers have the same exact kinetic sequence. The golf pro will help you with your skill while, as a fitness expert, I will help your body get in the position for an efficient swing. The “five physical pillars” are flexibility, balance, strength, endurance, and power. We will start with flexibility and mobility make sure that you always do specific golf stretches before play. It is important to loosen up your neck,shoulders, hips, lower back, hamstrings, and calves . Think rotation and hold strectch for 10­30 sec. One of the best ways to increase hip rotation is to roll your hips around as if you were hula­hooping. Warming up your neck and ankle muscles is as easy as moving them around slowly from side to side. Hamstring and calf stretches can be done with the help of a set of stairs or a wall to push against. Reach one up to the sky to raise the rib cage. Standing back bend put hands on low back and then arch backwards face up to the sky and hold 10­-30 sec. 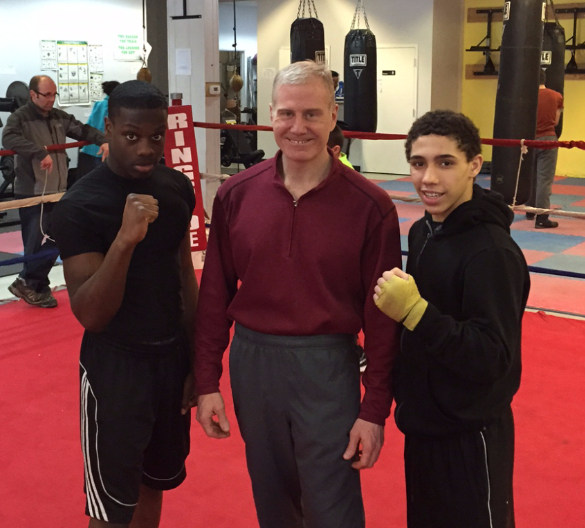 Jah-yae Brown, on the left, is the 15 year-old National Silver Gloves Champion for 156 pound weight class. This week I was asked to speak at Schenectady Ring of Hope boxing gym about dynamic sport-specific warm-ups. Ring of Hope has three boxers preparing for the 2016 Olympics. While I was there, I noticed that they didn’t have a sport-specific exercise program, so I designed one that is boxing-specific. The workout increases speed in footwork, using medicine balls and tubing for dynamic rotation and power. The most common injuries in boxing are shoulder and elbow injuries, so I designed a shoulder stability program. The boxing coach was amazed at how many imbalances there were in his athletes when I did assessment tests. Even Jah-yae Brown, the National Champion in his age and weight class, had muscle imbalances that could result in injury. By taking corrective steps in fixing his problem, just imagine how much better he’ll be doing sport-specific warm-up and training. The athletes were so inspiring, I decided to volunteer my expertise to these young men once a month. In other news, I began writing a fitness column for the Wolfert’s Roost Country Club. You can read this first one here. I’m also working with the Union College Division I golf team, sharing my sport-specific warm-up and golf fitness expertise. Being good at golf requires great skill, learned over time. There are aspects of the game that can only be gleaned from repetition and making mistakes. That’s a given. Before you can begin to hone those skills, however, you have to tone your body. Fitness is essential to keep yourself safe from injury, and it’s also important for giving yourself the musculoskeletal control and flexibility necessary to absorb the lessons of the course into your muscle memory. Make sure that you always stretch before you play golf. It’s important to loosen up your neck, shoulders, hips, lower back, hamstrings, and calves. One of the best ways to increase hip rotation is to roll your hips around as if you were hula-hooping. Warming up your neck and ankle muscles is as easy as moving them around slowly form side to side. Hamstring and calf stretches can be done with the help of a set of stairs or a wall to push against. You may choose to stretch against a golf cart, but I would encourage you to skip the cart and walk the course on your own two feet. That will help keep your muscles looser and keep you in better shape overall. Golf is hard, life is hard, but if we cultivate stability, beginning with whole-body physical fitness, we can bounce back and learn from our experiences without worrying too much that we will be thrown off course. Loss of Posture is defined as any significant alteration from your body’s original set up angles during your golf swing. This loss of posture can affect all aspects of the golf swing including timing, balance and rhythm. Losing your spine angle or altering your posture usually causes two typical miss hits, the block to the right and a hook to the left. And as most competitive players know, having two misses, one to the right and one to the left, can be disastrous in tournament play. In order to not lose your posture during the golf swing several physical characteristics must be developed. First and foremost, research has shown that any limitation in performing a full deep squat or full hip bend can force a player to lose their pelvic posture during the downswing. Failure to perform a deep squat means generalized stiffness and asymmetry in the musculature and joints of the lower body. This limitation will always limit a good set up posture and force players to alter their spinal posture throughout the golf swing. These limitations are best evaluated using the Overhead Deep Squat Test and the Toe Touch Test. Secondly, the ability to separate your upper body from your lower body allows your shoulders to rotate around your spine without altering your original posture. Limited trunk to pelvis separation is usually caused by reduced spinal mobility and shortened lat flexibility. This separation is best be evaluated using the Seated Trunk Rotation Test, the Reach, Roll, and Lift Test, and the Lat Test. Next, the ability to stabilize your spine angle during the swing is directly proportional to the strength and stability of your core musculature (your abs and glutes). When it comes to spinal stabilization the core is the king. These muscles help keep your trunk forward flexed throughout your golf swing. Core strength is best evaluated using the Pelvic Tilt Test and the Bridge w/ Leg Extension Test. Finally, in order to rotate around a stable posture one must have good flexibility in your hips and shoulders. This allows you to get the club into key positions without altering your spine angle. The overall flexibility of your hips and shoulders are best evaluated using the 90/90 Test, the Lat Test and the Lower Quarter Rotation Test.